At Two Funny Girls, we love any excuse to throw a party! With Cinco de Mayo right around the corner, there’s no better way to celebrate than with your own Mexican fiesta. We put together our signature Two Funny Girls products with some cinco-inspired recipes. We’ve got you covered from tacos to margaritas! Read more to get the fiesta started. One of the greatest parts of Cinco de Mayo is celebrating with authentic Mexican cuisine. Go traditional for your taste buds with everyone’s favorite – tacos! We love this recipe for tacos asada that is easy to make and sure to fire up your fiesta. Plate them on our Cinco de Mayo plastic personalized plates for a cute and customizable twist. The best part of hosting at home? Guac is never extra! For the ultimate Cinco de Mayo appetizer, we love chips and guacamole that guests can munch on all fiesta long. Our personalized Mexican fiesta cocktail napkins are the perfect pairing and provide for easy cleanup! Satisfy any sweet tooth with a classic churro. If you decide to go homemade, we recommend this easy and traditional churro recipe. Don’t worry, they are also just as good store bought! Make them memorable by serving in our personalized Mexican fiesta cups. They are hard plastic, making them perfect for serving as well as becoming the perfect personalized party favor! It wouldn’t be Cinco de Mayo without the perfect margarita. Add a signature sip to your personalized party. Swap store-bought margarita mix for an exciting twist on a fiesta favorite. Our pick is this grilled pineapple margarita from Platings and Pairings with simple yet spicy jalapeño-infused tequila. If you already have the grill fired up for fajita veggies and other taco toppings, this grilled pineapple margarita recipe is as simple as uno, dos, tres! Turn this recipe into a Mexican mocktail by replacing the tequila and triple sec with a sparkling soda. We love the idea of serving the grown-up version of this drink in our personalized shatterproof frosted cups. Our 10-ounce option makes for the perfect pour. For the younger party-goers, we love our signature custom stadium cups. These cups for the kids make for easy cleanup or a south-of-the-border souvenir! Customized decorations take your party from siesta to fiesta. We love keeping it simple yet spicy with a few key items. Our personalized latex Mexican fiesta balloons add a signature touch! They come in packs of 25, making for the perfect amount to decorate any outdoor or indoor space. Pair custom printed balloons with classic piñatas, but don’t let these decorations go to waste. Turn your party piñatas into a game guests will love by filling them with treats. Make one for the kids filled with candy, and one for the adults filled with mini liquor bottles and our custom koozies for a grown-up take on a classic party game. Our koozies are the perfect personalized party favor and will be the sombrero on top of your fiesta! Taco ‘bout a graduation party! Nothing kicks off a celebration like a taco bar fiesta that any graduate will be sure to remember. We can help you add a cute and custom touch with personalized balloons, cups, plates, and napkins! The key to any great graduation party is personalization! Deck out everything from balloons to napkins with your grad’s name and school colors… olé! For a taco party theme, stick to anything vibrant and fun. We love stringing up some of our custom printed graduation party balloons for an easy pop of color. Tie in the theme with a fun fiesta banner like this one – found on Amazon! Step Two: Build Your Taco Bar! We love a taco-themed graduation party because it is SO easy to set up and everyone loves a good taco! It’s not fun if it’s not a mess – so lay out some of our favorite personalized cocktail fiesta napkins. Grab taco shells, your choice of meat, fresh toppings, and of course, a good guacamole. We suggest you lay them out in catering-style trays. You can find them at any party store! Add a little personalization with our graduation fiesta plates to make your grad the star of the show. Step Three: Make it Sweet! For a sweet treat, we love the idea of an on-theme snack. Try this fun cactus look-a-like that is easy and quick to whip up! Store them in small potted plants or our personalized fiesta party cups for a reusable option. This snack is sure to be a hit at your grad’s fiesta! Who said the parents can’t have a little fun?! Add a kick to a classic with this spicy margarita recipe from Love and Lemons. For the grad and their guests, go for a fun mocktail that pairs perfectly with any taco creation – we love this recipe! For a memorable margarita, hand out our personalized fiesta Styrofoam cups… added bonus is easy clean up! Celebrate any graduate with a fun taco fiesta that will be hard to forget. Keep the fiesta going long after and gift your guests with a cute and custom reusable cup! Not the host? Don’t show up empty handed…read all about the ultimate grad gifts for under $30! Planning A Gilmore Girls Watching Party? Planning a Gilmore Girls watching party? We will get you ready! As we anxiously await Gilmore girls: A Year in the Life we need to set the stage for creative binge watching. Of course our first entry is the best way to drink Miss Patty’s Founder’s Day Punch or another town favorite beverage, coffee. These Luke’s Diner Paper Coffee Cups come in sleeves of 5 with plastic traveler lids. They are the perfect drink ware to take you back to Stars Hollow even if Luke himself can’t serve it for you. He can in your head. A sleeve of 5 cups is $7. I would love to see a group of 20-40 somethings watch 4 episodes with no use of their cell phone, but oh isn’t this adorable. 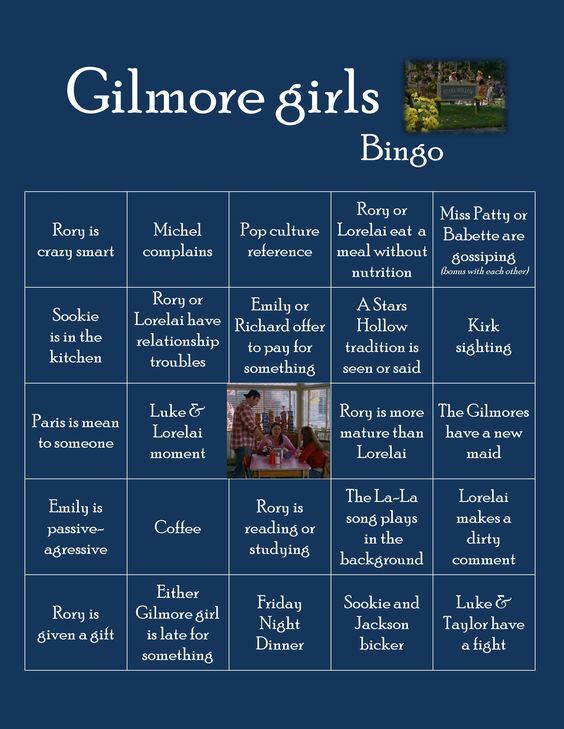 Pinterest is filled with so many ideas for your Gilmore girls watching party – but we loved this bingo card to give you something to do while watching hours-on-end television. From “the Gilmore’s have a new maid” to simply “coffee” it won’t take long to blackout this card, or simply get a bingo. Give your guests your favorite Chinese takeout and pizza. You can even throw in a batch of French fries, pop tarts or red vines to create your own Gilmore girls trifecta buffet. All these snacks are making me hungry! Is it November 25 yet? Keep it cool this summer with our super cute and affordable personalized koozies! We can do individual or bulk print (12 or more) for any special events, making them the perfect favors for girls weekends, weddings or family beach trips. We love working with brides, event planners and party-throwers. And, we can create personalized koozies to commemorate your event. These custom insulators look cute sitting on each seat with a cold bottle of water for any outdoor or beach weddings. Or, simply display them in a basket for guests to have as a personalized party favor when they leave. Maybe you want to consider party favors for your event. These collapsible monogrammed beverage insulators have patterns and colors on both sides. Our personalized koozies fit 12 oz cans, long-neck bottles, 16 oz. water bottles and collapse flat for easy traveling. The polyester fabric on the outside side with a rubber insulator underneath keeps those drinks cool. Personalized beer bottle koozies are printed with a custom monogram on one side and zipper on back for a snug fit. These beer sleeves are great for weddings and fit standard-size long-neck bottles (12 oz) and collapse flat for easy traveling. Order a monogrammed assortment for backyard guests, or they are a cute way to add a monogram to your weddings – and they keep those drinks stylishly cool. No Can or Bottle? No Problem! The newest addition to our monogrammed koozie collection, we now have cute koozies that fit most wine glasses. Since not everyone is drinking beer or wine, they also fit most SOLO®-style plastic party cups, disposable coffee cups, fast food cups, and even plastic tumblers! So handy, you’ll want more than one to keep at home, on the boat and by the pool. Ordering is easy on our Two Funny Girls website. Our monogram canvas tote bags are study totes that can stand straight when empty with a flat bottom. With contrast handles and trim, the large main pocket includes interior organizing slip pockets, key fob and a flat front pocket. made of 24 oz, 100% cotton canvas this will be your new favorite bag for trips to the grocery store to weekend trips away. Our personalized Dopp Kits or traveler bags are perfect for travel anywhere – camp, slumber parties, vacations, the gym…they make great gifts, too. We have all shapes, colors and sizes for guys and girls. Our personalized tote bags are ideal for everything from groceries to garden tools and beach towels. Choose from a cotton canvas or polyester fabric to create your custom tote bag with your choice of a monogram font or thread color. From cosmetic to tote to laundry, we have a bag ready to customize with embroidery for you. Personalize any bag with either a name in our stylish fonts or one of our monogram styles. Need packing tips for different sized bags? Check out this helpful article from Buzzfeed before you book your next trip. Don’t forget to order your travel bags now so they are ready to use all summer long. It’s not everyday you get to join some sassy Dallas socials for a Bachelorette Watching Party at Hotel Zaza! In May, Circle Seven Five gathered together for THE event we have all been waiting months for… the season premiere of The Bachelorette, featuring fellow Dallas babe Jojo Fletcher. The Everyday Hostess helped pull of a memorable evening. Two Funny Girls was happy to add some flair to the soiree with custom party supplies! You can order them for your next get together too. Our beautiful personalized napkins are the perfect finishing touch for your event. Whether you are hosting a wedding or a evening soiree, a milestone anniversary party, birthday party, Bar Mitzvah, Bat Mitzvah, holiday party or just relaxing and having a good time with family and friends, you’ll find the right napkins from our napkin styles. Custom drink stir sticks add that air of sophistication to any drink served at your wedding or other celebratory event. These personalized drink stirrers are fun to have on hand at the house to have on display to dress up any bar cart or bar area. Our personalized stir sticks are ready for you to design. Choose from our variety of swizzle stick top shapes (oval, circle, square or rectangle), lengths (6″ or 7.5″) as well as the material choices of wood or 5 plastic colors. You can personalize our custom drink stirrers with a monogram, single initial or design in your choice of imprint color. We highly recommend monograms or text of less than 4 words. Looking for a refreshing pink cocktail? Try this recipe from Mix & Bash! Combine in a pitcher the Barefoot Pink Moscato, pink lemonade concentrate, and lemon-lime soda (more or less depending on your taste). Serve over ice! Father’s Day: Don’t Forget About Dad! Give your dad a memorable gift this Father’s Day with something monogrammed! Check out our selection below for unique and personalized ideas. Make sure to check shipping and production time so your gift arrives in time! Our personalized paper coffee cups are the perfect way to dress up your at-home made latte. Our paper coffee cups can even come with the raised lids found in coffee shops! Coffee cups don’t get any cuter once you adorn them with your monogram, custom artwork, or text – and we even created some coffee house logos awaiting your family or lake house name. Our 16 oz personalized Styrofoam cups are our number one seller when it comes to personalized cups – and how festive to adorn these cups with a camoflauge print for the hunting lodge or cabin? From coffee to coke, these 16 oz personalized Styrofoam cups are great to hold most beverages. These 16 ounce monogrammed foam cups with camouflage print background are the most versatile size if you just want to order one cup to cover a variety of drinks such as soda, beer and margaritas. Our personalized foam cups are visually appealing and an affordable method to celebrate Father’s Day or they make a perfect gift to start a hunting or fishing guys weekend, too. Father’s Day is this month and Dad deserves something sweet don’t you think? Homemade cupcakes are a great treat for Dad. Check out these Dad-inspired cupcakes from www.thecelebrationshopee.com! Whether he loves working in the yard or taking the boat out for a fishing trip, everyone will love these cupcakes. Personalized wood cutting boards are made for more than just cutting! You can leave these personalized cutting boards out on your counter top to add style to your kitchen or bar- they are too pretty to keep in a cabinet. Choose from several layout designs to create a look that is just perfect for you or your gift recipient. These wood cutting boards are perfect serving tray for cheese and crackers, veggies and more for family celebrations and cocktail parties. Looking for affordable, creative, personalized teacher and staff appreciation gifts? Look no further…we have your one stop shop for teachers, crossing guards, office staff, specials teachers, school cafeteria employees and more! Our styrofoam cups are a cute and affordable gift when packaged in a 10 count bag tied with a matching twist-tie ribbon. These make great teacher and staff appreciation gifts from PTA or PTOs. We can print your school name, organization name, a monogram, custom artwork, or choose from our available type-styles and stock art to create your own design. Show your school pride! Koozies don’t get any cuter than these – and make a perfect and affordable gift for school staff members and teachers! Collapsible monogrammed beverage insulators have the printed designer patterns and colors on the entire koozie with a place for text (it can be different!) on either side. Our personalized koozies fit 12 oz cans, long-neck bottles, 16 oz. water bottles and collapse flat for easy traveling. This personal touch will mean the world to your teachers! Type up a class list and order from Lesley Grace Designs on Etsy. Frame it or add cute binder clips for displaying in the classroom. Get together with the other parents to buy copies for the kids too. This treasured keepsake will live on after your little one graduates! Personalized notepads for teacher appreciation are a cute and useful idea for any parent group that is looking for an affordable teacher gift that doesn’t look cheap. Create a half page (8.5″ x 5.5″) notepad in your school colors and adorn with the same text on each notepad. Each notepad will be 50 sheets and comes glued at the top with a cardboard backer. Everyone loves gift cards. Need something fast for those upcoming end of year parties? Grab a coffee shop gift card and print out this adorable card for your child to sign. Attach a cardboard cup sleeve and you are ready for teacher appreciation week! Check out ThriftyNorthwestMom.com for your FREE printable.